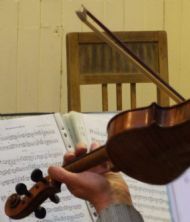 We are an informal group of amateur musicians, based in Aberdeenshire, who play traditional and contemporary music originally in the style of the Strathspey and Reel Societies of this part of Scotland (although our style is evolving into something quite unique, and we are not a formal Strathspey and Reel Society). Alford Fiddlers were formed in September 2004 following a meeting which discussed the need for such a group based in Alford to serve the Alford, Strathdon, Lumsden, Tarland, Lumphanan, Midmar, Sauchen and Monymusk areas. Members travel from far and wide as well as from the immediate area... we even have one member from Israel who joins us when he is visiting relatives in the area. We count ourselves as being very lucky to be able to make music amongst such glorious scenery. 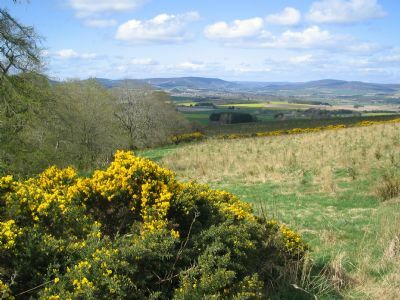 This photograph, taken from Kist Hill, Whitehouse, shows Alford in the middle distance, and beyond, the upper Don Valley and surrounding hills. Photograph courtesy of Fiona Bruce. We are extremely grateful to those who have helped our group in the past (Royal Bank of Scotland, Alford, The Co-Op, Alford, Grampian Transport Museum, Alford Railway Museum, Alford Heritage Centre and The Howe Trinity Church Hall). We are available to play for charities and fund raising events, please contact us via the feedback page.